RAPAPORT... Fraudsters created an imitation emerald by assembling five pieces of glass around a beryl core using a “laborious multi-step cut-and-glue process,” according to the Gemological Institute of America (GIA). 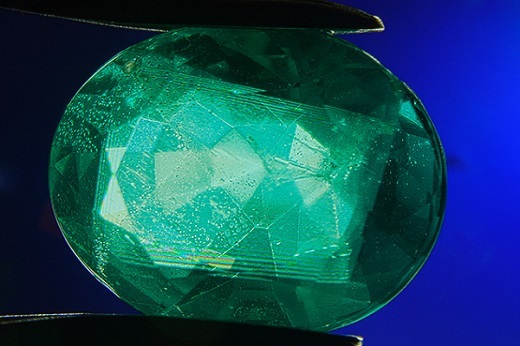 The inside of the 3.35-carat stone — which the New York branch received for grading — was a natural beryl, a mineral of which emerald is a variety. However, the crown consisted of a single piece of glass glued onto the pavilion. The pavilion itself featured four interlocking, asymmetrical glass segments glued to the beryl core with colorless cement, the GIA explained. The act of creating the fake stone was probably lengthy and complex, GIA gemologists Tyler Smith and Augusto Castillo noted in the summer 2018 issue of Gems & Gemology. At each stage of the creation process, the manufacturers attached one glass segment to the beryl core, and cut the glass and the beryl to make a flat surface to which they could attach the next piece of glass, according to the GIA’s proposed model of how the assembly took place. Once the artisans had stuck the four segments to the core, they polished it to create a flat surface onto which they added the glass crown. The GIA researchers initially spotted multiple, nonparallel cement planes when examining the stone under a microscope. Further tests confirmed the presence of glass. Fraudsters have imitated precious stones using assemblages of various materials for centuries, with records of such activities dating back to Roman author Pliny the Elder’s Natural History in the first century, the GIA explained. However, this was the first time the New York or Carlsbad laboratories had received an assembled stone of this type. What Makes a Good Synthetics Detector?